This was the birthplace and childhood home of Alan Turing, pioneer of computer science. 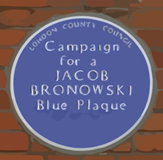 On 23 June 1998, on what would have been Turing’s 86th birthday, Andrew Hodges, his biographer, unveiled an official English Heritage Blue Plaque here. Visiting 2 Warrington Crescent is now the Colonnade Hotel. Novelist George Eliot was born in South Farm in 1819 and lived here for four months before the family moved to nearby Griff House. Sorry, this article hasn’t been completed yet. Would you like to write it for us? Humanist Heritage relies on contributions from users so if you’re interested in helping us please drop us a line.